When someone asks who the best tag team in the world is, one of the teams always in the conversation is The Usos. The six-time Tag Team Champions have completely revolutionized the world of tag team wrestling, and now they'll take their high-impact, smashmouth action to Monday nights. Since the brand split began, The Usos have never left SmackDown Live. While many faces changed, Jimmy and Jey were the consistent factors on the blue brand, taking on all challengers new and old. Just in their SmackDown Live run alone, The Usos have knocked off teams like American Alpha, Breezango, The Bar, and The New Day. In fact, the wars that The Usos and the New Day waged while competing on Tuesday nights gave SmackDown Live a considerable edge over Monday Night Raw. Their tag team scene was unbeatable. Every team on the Blue Brand has been locked up in the Uso Penitentiary, and now Jimmy and Jey look to set their sights on some fresh meat. Bobby Roode and Chad Gable challenged any team backstage to take them on tonight, hoping to get back on top as they look to challenge for the Raw Tag Team Titles soon. They weren't expecting the future Hall of Fame duo to show up, however. The Usos exploded onto Raw with the WWE Universe going wild. As Roode and Gable looked to pick up some momentum, it wasn't in the cards tonight. The Usos once again proved why they're one of the greatest tag teams in professional wrestling today with a pretty dominant win over the former Raw Tag Team Champions. With the Viking Experience making their main roster debut earlier in the night, Monday Night Raw has picked up two of the best teams in the company. 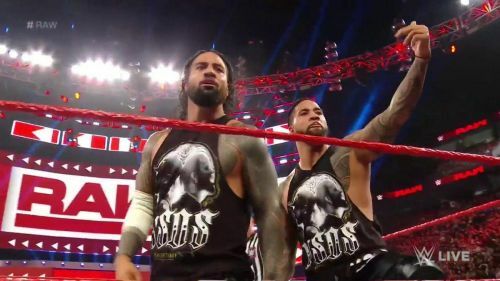 The A-Show picked up quite a bit of steam heading into the rest of 2019, and The Usos hope to do the same thing, capturing the one title they've yet to hold on the main roster, the Raw Tag Team Championship.